The Alnwick hotels listed below are either in the town or we have given a rough guide as to how far they are from Alnwick. We hope you enjoy your stay and find your ideal accommodation. Situated in the historic town of Alnwick, the hotel has recently undergone a £3/4 million refurbishment. Oozing character and steeped in history the White Swan offers a unique insight into life in years gone by. For example, the Olympic Suite, salvaged from the SS Olympic, sister ship of the ill fated Titanic, and situated near the newly opened Alnwick Gardens and home of 'Hogwarts' from the Harry Potter films. Station: ALNMOUTH. 4miles. Travelling by car: take the A1 to Alnwick. Follow the signs to the Town Centre. Take the second exit from the roundabout. Drive through the tower, and the hotel is on the right. In the centre of Alnwick, this 300-year-old coaching inn is a short walk from Alnwick Castle and Gardens. Its restaurant's decor was salvaged from the Titanic's sister ship. In the heart of the village of Warkworth, this 18th-century coaching inn is now a 3-star hotel offering attractive en suite accommodation and great-value, locally sourced food. 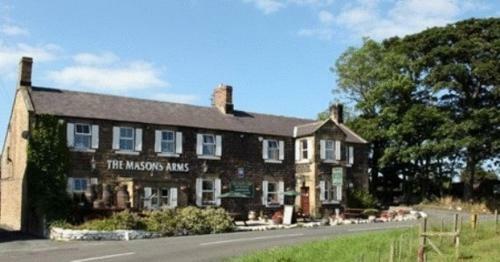 A 200-year-old former coaching inn, the Masons Arms boasts views of the Northumberland countryside. It is 10 minutes' drive from Alnwick and offers free parking, home-cooked meals and a bar. For hotels accommodation in other areas near to Alnwick Northumberland see Alnmouth hotels Amble hotels Beadnell hotels & Bamburgh hotels.